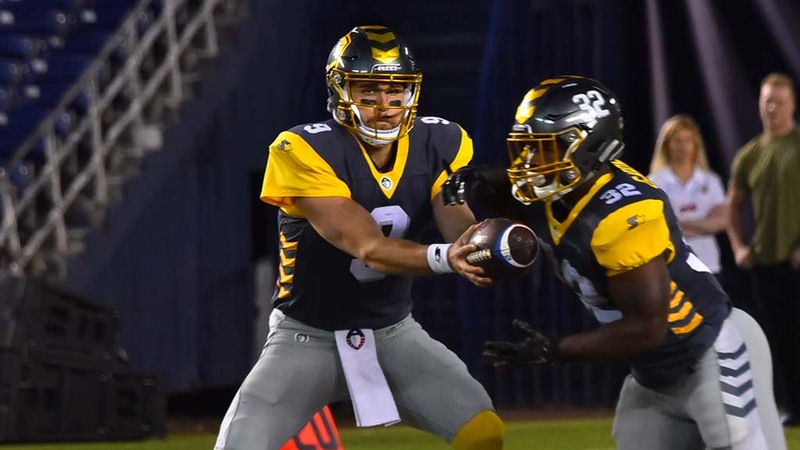 Quarterback Philip Nelson will be sidelined because of a shoulder injury when the San Diego Fleet resumes play Saturday against the Salt Lake Stallions at SDCCU Stadium, coach Mike Martz said. Nelson suffered the injury in the second quarter of Saturday’s 26-23 loss to the Memphis Express in Memphis. Alex Ross threw a 30-yard touchdown pass to Marcus Baugh two plays after Nelson was injured to give the Fleet a 20-6 lead five minutes, 41 seconds before halftime. However, in nine full possessions under Ross, the Fleet were held to a field goal. Ross fumbled the ball twice in the fourth quarter when sacked, with the Express recovering both times, and threw an interception in the second quarter. Memphis scored 14 points off those turnovers. Ross was sacked four times, with three of the sacks coming in the fourth quarter. He completed eight of 18 passes for 80 yards and one touchdown. The Fleet gained 124 yards, had seven first downs and punted three times in their nine full possessions under Ross. They gained 140 yards, had eight first downs, missed a field goal and lost a fumble before Nelson was injured. Nelson completed nine of 12 passes for 110 yards including a 6-yard touchdown pass to Dontez Ford in the first quarter. The Fleet (2-2) have had far more success with Nelson at quarterback than with the other two quarterbacks on their roster, outscoring their opponents by 37 points when he has been in the game. They were outscored by nine under Mike Bercovici and by 11 when Ross has played. Bercovici has not played since being replaced by Nelson early in the fourth quarter of the Fleet’s 15-6 loss in their season opener Feb. 9 against San Antonio. Ross did not play in the Fleet’s first three games. Facing a defense designed to stop the run that Martz said prompted him to call more passing plays, the Fleet also had a sharp decrease in production by their running backs from last Sunday’s 31-11 victory over San Antonio. Ja’Quan Gardner ran for six yards on nine carries Saturday after being selected as the AAF’s offensive player of the week for rushing for 122 yards on 12 carries, including an 83-yard touchdown, against the Commanders. Terrell Watson ran for a game-high 43 yards on 10 carries against Memphis, six days after running for 73 yards on 13 carries. The only points the Fleet scored after Ross’ touchdown pass were on Donny Hageman’s 46-yard field goal on the third play of the fourth quarter that increased their lead to 23-15. Memphis (1-3) tied the score with 6:01 to play on a 6-yard touchdown pass from Zach Mettenberger to running back Terrence Magee and Mettenberger’s run on the required two-point conversion attempt. The touchdown came four plays after Ross was sacked and fumbled, with Express defensive back Jeremy Cutrer recovering at the Fleet’s 21-yard line. Punter Sam Irwin-Hill was tackled for a 4-yard loss on a fake punt on a fourth down and 3 yards to go play on the Fleet’s next possession, giving Memphis the ball on the Fleet’s 28-yard line with 4:24 left. Austin MacGinnis kicked a tie-breaking 45-yard field goal four plays later before a crowd at Liberty Bowl Memorial Stadium announced at 13,621. What proved to be the Fleet’s final drive ended with Ross sacked and fumbling the ball away at their 34-yard line with 1:42 remaining. Mettenberger completed 18 of 25 passes for 174 yards and one touchdown and ran 1 yard for a touchdown with 18 seconds left in the first half in his first start for the Express. The last time Mettenberger was the starting quarterback in an official game his team won was on Nov. 29, 2013, when LSU defeated Arkansas, 31-27, in a game Mettenberger tore an ACL, forcing him to miss the Tigers 21-14 victory over Iowa in the Outback Bowl Jan. 1, 2014. The NFL’s Tennessee Titans lost all six games Mettenberger started for them in 2014 and all four he started for them in 2015. The Fleet were outgained 285 yards to 225 and trailed 16-10 in first downs. They led in time of possession, 31:09-28:51, mainly thanks to a 7:21- drive in the third quarter that took them from their own 1-yard line to Memphis’ 42. That drive ended with a punt. The Fleet defense forced the Express to punt after three plays on the ensuing possession. The Fleet began their next drive on their own 36-yard line and picked up two first downs, leading to Hageman’s field goal. The Fleet opened the scoring for the first time in their four-game history as Ron Brooks returned Ryan Winslow’s punt 57 yards for a touchdown 2:38 into the game. The Express scored their first points on its third possession on a 46- yard field goal by MacGinnis. MacGinnis also kicked 40- and 35-yard field goals in the second quarter in his debut with the Express. MacGinnis was working as a financial adviser in Lexington, Kentucky last month when he asked management to allow him to take unpaid time off in an attempt to return to football. The Express announced his signing Wednesday, replacing Josh Jasper, who was cut that day. MacGinnis kicked for Kentucky from 2014-17 and was a first-team All- Southeastern Conference selection in 2014. He participated in the Chicago Bears minicamp in 2018. The Fleet played without two defensive starters from their first three games — middle linebacker A.J. Tarpley and defensive end Damontre Moore. Tarpley was sidelined because of a back injury and Moore didn’t play because of a knee injury. Tarpley was selected as the AAF’s defensive player of the week for returning an interception 27 yards for a touchdown against San Antonio. He also made five tackles, including one for a loss, against the Commanders. Moore shared the team lead with 15 tackles entering Saturday’s game. He has the second-most NFL experience among Fleet players with 55 games over six seasons with five teams.